(bargaining and negotiation, third-party mediation, and arbitration and adjudication) but also newer, nonofficial approaches that have attracted considerable attention for their innovativeness (social-psychological approaches, problem-solving workshops, conflict transformation, peace education, and training). 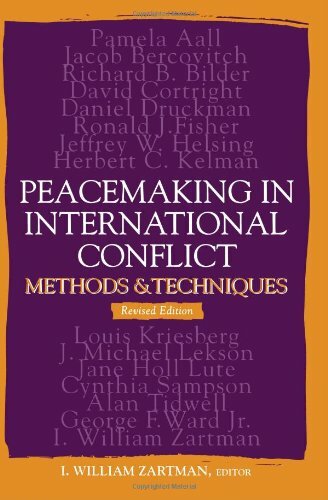 Written for all students of peacemaking and foreign policymaking both scholars and practitioners--the chapters in this revised edition of Peacemaking in International Conflict provide cogent analyses and offer practical lessons for a variety of conflict settings, from disarmament and arms-control negotiations to subnational conflicts in the new and emerging states of the post Cold War era: from the challenges for statecraft in addressing transnational political violence and asymmetric threats to international security. I. William Zartman is Professor (Emeritus) of The Paul H. Nitze School of Advanced International Studies at Johns Hopkins University.